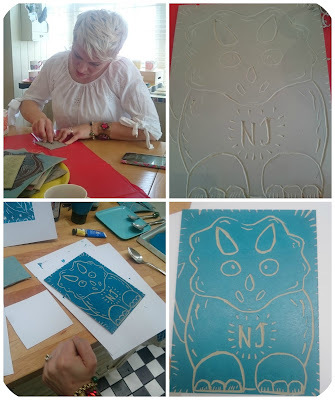 I was invited to a blogger's craft morning a couple of weeks ago, hosted by homewares designer Anna Hayman, where I got to learn a bit about lino cutting and printing and even got to create my own designs. Myself and four other Sussex-based bloggers spent the morning chatting, eating cake and crafting in a beautiful home in Lewes. The house was near Anna's workshop where she creates various designs on lino before transferring them onto fabrics, cushions, mugs and tea sets. I had a brilliant morning and here is what I learnt! Anna has always been a creative lady, starting out embellishing shoes from home when her children were young, before exploring colour interiors and homeware designing when they got older. Anna's current designs stem from a great deal of experimentation on her part, most of which can still be seen on her Instragram account. 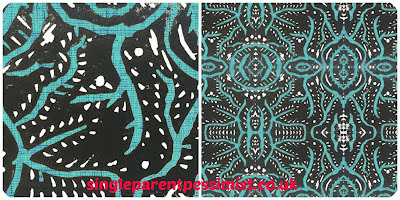 In the earlier days Anna designed much darker images using marker pen, but over time this changed to brighter, more colourful images using lino prints. Her style changed and grew largely from the feedback she got from followers of her Instagram account, and she continues to use the account to get both feedback and inspiration for her work. Anna cuts images into lino and then scans them into her computer. She uses software to manipulate the designs in various ways, including creating a repetitive pattern and testing out various colour combos using her five main staple colours; turquoise, red, blue, orange and yellow. Anna uses these shades because "I find these hues bring people the most joy". In terms of her designs, Anna said she sometimes has a design plan, but other times she "sees where it goes. There's times I hate the initial design but once I've finished it looks amazing". 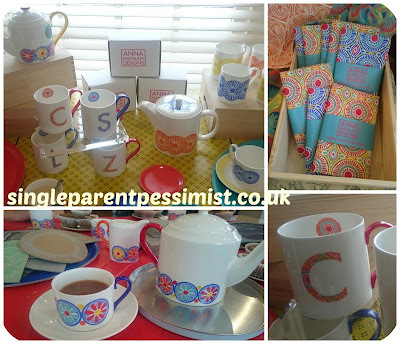 She currently has a range of mugs, teapots, tea towels and notebooks for sale using a circular design. These were launched three months ago and are so far quite a big hit with mugs starting from £16. Anna is in the process of designing a premium range of products for Christmas 2017 including a teapot which will feature real gold on it's handle, and a £120 price tag. 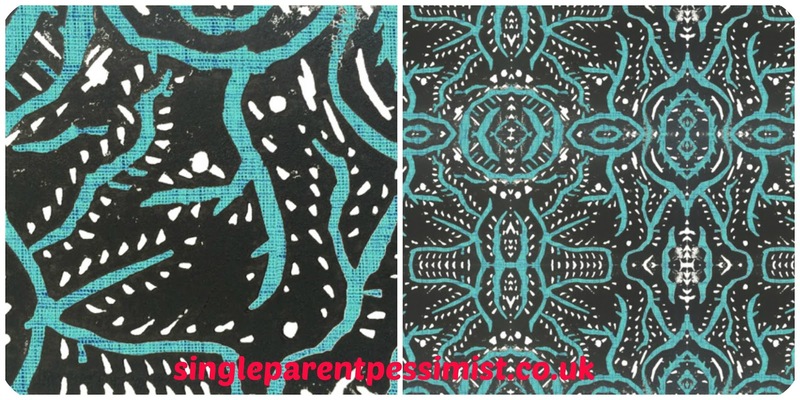 In terms of the future, Anna is looking into the possibility of creating a range of bespoke wallpapers based on her prints, which is something I'm hoping she may send my way to review if they're going to be anything like her fabric prints! Lino cutting looks simple, but is actually a lot more intricate, detailed and tough to do so definitely requires skill and patience. The tools used to make the grooves can be quite sharp if you are going for the finer lines, and I was surprised how much strength you have to use to dig each groove out but my arm enjoyed the workout! I didn't start my first piece with any set idea, I literally just started to make cuts and watched where I took it naturally. I found it really relaxing and because I had no set image in my head it was great to watch a blank tile turn into something quite pretty and random. When cutting you have to make sure you cut away from yourself and that your other hand is firmly holding the tile, but a distance from the cutting tool as one slip up and you could seriously hurt yourself. One blogger did cut their finger and for once it wasn't me! 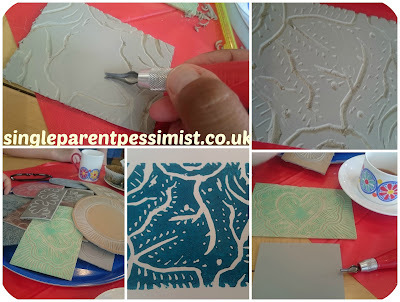 The tile ended up looking like branches/twigs and leaves and whilst I was there Anna used a turquoise paint to do a basic paper print for me. She then took the tile away and scanned it into her computer so she could create more shapes and images of it. The finished pieces are gorgeous and I would love to put them onto a dress or scarf. My second tile was slightly larger and this time I did have an agenda- a dinosaur for Chunk! I found a cartoon image of a triceratops and then used a pencil to sketch a similar outline. I didn't shade it much because I wanted it to be clean and bold. I was quite impressed with how it came out and it's now sitting on Chunk's bedroom shelf so I think he likes it too. I fell in love with the home we visited as it had my dream interior. 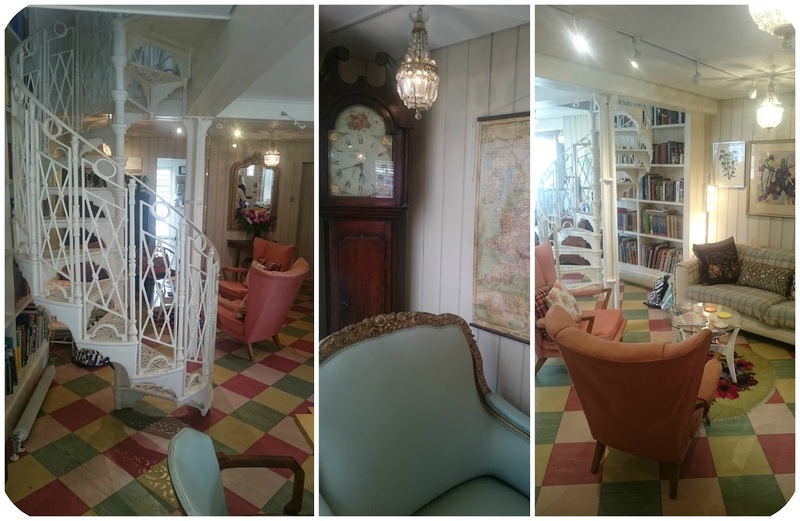 It was full of retro furniture like a grandfather clock, chaise lounge and a fab pink fan. There were antiques, gorgeous bold prints and a white spiral staircase to die for. Even the tiled floor was a gorgeous multi-coloured, retro delight. I had huge house envy and here are just a small collection of the photos I took of the downstairs. No payment was received for this post. All opinions are honest and my own.